You can find a list of all the hikes that I’ve done and any extra information that might be useful here. Each link leads to the page for that hike and has details on the trail, how to get there, what you need, maps etc…… If anyone needs any more info, please feel free to contact me. The Bai Yue are the top one hundred mountains in Taiwan. They’re all over 3000m above sea level and Yushan 玉山, just shy of 4000m, is the tallest. Permits are needed to climb most, particularly the more difficult ones and they usually need to be applied for in advance. Taiwan Adventures are based in Taipei and they lead many trips to Taiwan’s high mountains. There are some of the Baiyue that are just an hour long walk up from a road and are very easy to do. Dabajianshan – 大霸尖山 -The huge barrel shaped mountain in the Sheipa National Park. Can include 3 other Baiyue, Yizeshan, Xiaobajianshan and Jialishan. Jiaming Lake – 嘉明湖 A huge lake created during the last ice age some 6-7000 years ago. The Sixiu – 四秀 Part of the Xueshan Mountain range, this hikes covers 4 Bai yue peaks. Snow Mountain – 雪山 3ft of snow! Qilai South Peak – 奇萊南峰 Only one peak on this visit but there’s plenty of potential for more. Taiwan is fantastic for hiking and camping in the mountains. While everyone else sweats it out in Taipei, you can take in some cool mountain air and escape the heat and pollution of the city. Sometimes you need to apply for a permit and for smaller mountains that is a simple case of turning up at the local police station and telling them what you’re going to do. After that you’re pretty much free to hit the trail and whack your tent down wherever you like. Songluo Lake – 松羅湖 A beautiful lake surrounded by mountains on all sides. 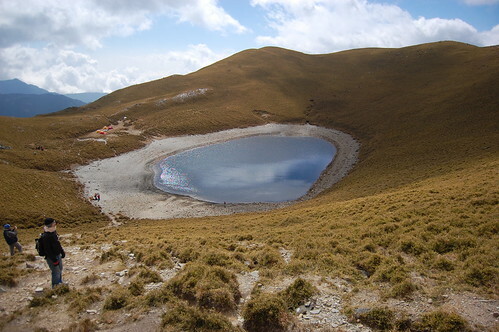 Jialuo Lake – 加羅湖 This hike actaully passes a few lakes, the highest is over 2000m above sea level. Syaroko Historic Trail – 霞喀羅古道 Originally created by aboriginal tribes and later widened by the Japanese, this historical trail is a wonderful two to three day hike. Jiaming Lake – 嘉明湖 A huge lake created by a meteor strike some 3000 years ago. A lake, a Cave and a Peak – Some fantasting hiking and camping just north of Alishan. Dabajianshan – 大霸尖山 – The huge barrel shaped mountain in the Sheipa National Park. Can include 3 other Baiyue, Yizeshan, Xiaobajianshan and Jialishan. Most of the hikes that I do are day trips from Taipei. Transport can be problematic and usually I ride my bike to the trailheads, however, where public transport is available I’ve tried to give details. Two excellent books are available in English, Taipei day trips 1 and 2. Book 1 can still be found in Eslite, Caves and Page One but book can only be bought from the community centre directly as some of the trails listed have changed/disappeared. If you’re interested in a guided trip to some of Taipei’s mountains, get in touch with Taiwan Adventures. 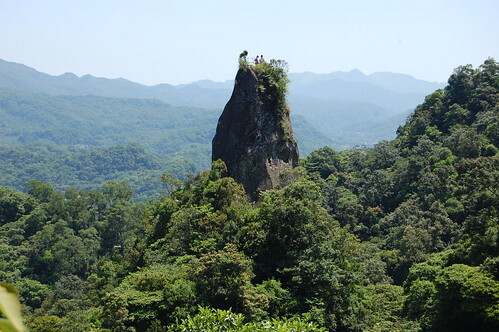 Xiaozishan – One of the insane peaks in Pingxi. Yuemeikeng Waterfall – A beautiful, hidden away waterfall in Yilan County. Sandiaoling Waterfalls – Four awesome waterfalls in one trip! Baiyang Waterfall, Taroko Gorge – A great, tough hike in Taroko Gorge. Eagle’s Nest – A very short hike with some awesome views of the coast. Baiyang Waterfall – A beautiful hike to a waterfall in Taroko Gorge. Made much more difficult now because of the new trail entrance in Tianxiang. Xinxing Wild Hotsprings 新興溫泉 A beautiful hotspring waterfall in a remote part of Taoyuan County. 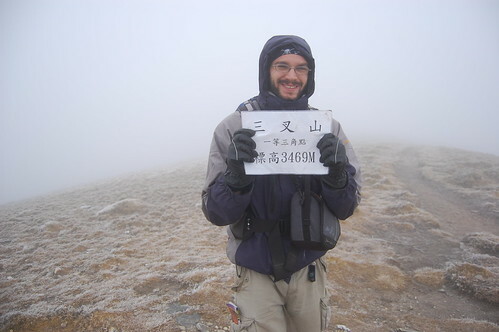 Beichatian Mountain – 北插天山 A tough climb in bad weather but very rewarding. Also passes by a group of giant redwoods. Tapung Fort – 李棟山古堡 An abandoned Japanese fort almost 2000m above sea level. Qixingshan by night – 七星山 The highest peak in Yangmingshan, this mountain has wonderful 360 degree views. Wai Niao Zuishan – 外鳥嘴山 A tough and exhilarating hike in Xinzhu county. The Four Beasts and others – 四獸山 Just south of Taipei 101, this is the perfect place to come and view neon lit Taipei. Jiuwufeng – 九五峯 Part of the four beasts. Zhuzishan and Alibang Waterfall – 竹子山與阿里磅瀑布 A beautiful waterfall in a more remote part of Yangmingshan. Silong Waterfall – 四龍瀑布 Get massaged by a 40m high waterfall! Xinshan – 新山 An exciting ridge walk set above a beautiful lake. Huang Di Dian – 皇帝殿 One the most exciting ridge walks you can do, not for the faint-hearted! Fengtoujian – 峰頭尖 Another scary but exhilarating ridge walk in Pingxi. North ChaTian Mountain – 北插天山 Probably the best day hike you can do from Taipei. Absolutely stunning scenery. Sileng Wild Springs – 四稜溫泉 Bathing under a hotspring waterfall, what could be better? Dude, awesome blog. I just moved to Taipei and am anxious to hit up some mountains. I’ve hiked the Appalachain Trail, and the Baekdudaegan in South Korea. I was wondering if you know any longer distance trails – like 4 or 5 days up to a month or so. All of the information I can find are for one or two day trips. Thanks, much appreciated. There are loads of longer hikes you can do. Have a look at barking deer. They do all sorts of trips anything from 2 days to 7 or more. Also for longer hikes you need to get sorted out with permits which can be difficult if you don’t read or write Chinese and these guys can help you out with that. Hope that helps! I’m a freelance travel writer doing a feature on Taiwan hiking for a magazine. I’m interested to work with you. Sent you details via Flickrmail! Hope to hear you soonest. I’ll be in Taiwan from Feb 13-21. Thanks for the awesome website! Very helpful information, especially with public transport and the like. I’m in Taipei doing an elective and would love to try out some of these hikes on the weekends! Your pcitures look great! I was wondering if you could point me to some interesting, or higher elevation day hikes (4 – 6 hours) in and around the Taroko National Park area? In the gorge there are a few. Zhuilu is a very exciting trip but requires a permit. There’s also the Wenshan-Lushui trail and the Baiyang Waterfall trial. Both have only recently opened up again. have you done any hiking in the south of taiwan? i wanted to experience tropical or subtropical forests, and the lonely planet mentions the Walami and Jin-Shui Yin trails, not sure if you have any experience of those? Sorry, I haven’t been to either of those places yet. I don’t get down south nearly as often as I should! Can you comment on how you deal with the permits and regulations? As a Canadian hiker things are so….well….restrictive. So much paper work, some plaes you have to travel to in order to apply for either the permits usually needed. Do you know of a shortcut? Walami – Awsome trail. The first section is popular with tourists but after about 45 minutes the trail will be all yours. Train to Yuli, then you’ll have to rent a scooter (walk left side of train station driveway and ask at the betel nut stand. Nice lady. You can also taxi it….never done it but perhaps in the 300NT – 500NT range. Arrange for a pick up. Stop at Park Office, ask for permit. Get it and take it to police station up the road (walking distance). The trailhead is about 5km up the road (about). Excellent for day hike, also has cabins that you can use for overnights. JinShui – You can access from both the east and west coast, but since I reside on the east, ill tell it from the east! Option A: Train to Dawu. Walk river for about 1.5 hours (START ON THE RIGHT UPSTREAM BANK AND AFTER ABOUT 50MIN STAY TO THE RIGHT OF THE MAJOR CONFLUENCE….DONT GO LEFT!!) and you will reach a suspension bridge. Scramble up to the bridge and hit the trail. Option B: Train to Dawu. Walk/taxi along the road SOUTH of the main river in town. The last two times I was there this road was totally gone from landslides and impassable. You can walk along the road until the landslide, then scramble down to the river and continue upstream until the suspension bridge. If the road is passable, take it all the way to the trailhead. No scooter rentals in Dawu…but a taxi can drive you and arrange for a pick up. Both totally worth your time!!!!!! Thanks for that. I’ll be sure to check them out. Great website. Thank you for all the info! Me and my friend are planning to visit Taiwan end of April. We are hikers and are there for 4 days. with 4 full days to spare (actually leaving at 2100 on the 4th day back to HK), what top hikes would you recommend? I’d recommend doing Elephant Mountain, it only takes an hour or so and has great scenery at night. Also Huangdidian is well worth doing. Easy to get there on public transport and it’s a very fun hike. If you need any more info, let me know. I was wondering about the possibility of hiking in June and July. Not been to Taiwan before, but heard its very hot and humid during those months, so was thinking of mountain escapes. Is it recommended to hike at these times? June and July are fine for hiking. If you’re at lower elevations, you’ll need to carry a lot of water as dehydration can be a problem. In the higher mountains it’s less of a worry and the night time temperatures can actually be quite low. this is my first time on this site. I live in Chia Yi Taiwan studying Chinese. I am trying to find a hiking partner or partners to go hiking around here as we have many places such as Alishan Mountain and some historic trails. If anybody is in Central Taiwan and would like to go on any weekend or day hiking trips, let me know!! I am not familiar with the permitting procedure for the higher peaks or how easy it is to get a permit or how long it takes. My experience is that there are plenty of places to hike where you don’t need them and can still get away from crowds and tourists. Please contact me above if you are going to be in this area and want to go hiking and dates and we can plan something!! Hey I don’t know if you are still here in Taiwan but if you are and still interested in a hike I’m down. Hit me up! 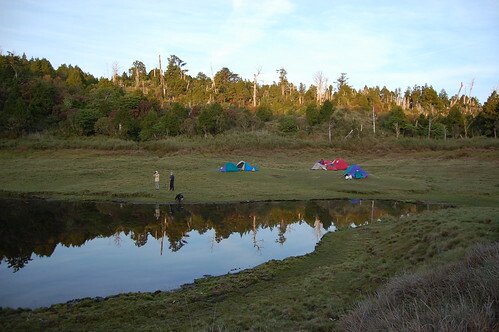 Jiaming Lake is a cirque lake(a kind of glacial landform), not a meteorite lake. And it formed on 6000~7000yr ago. I looked at this article for writing my blog. Do you have any links about the lake being a tarn? I found this which seems to say that the problem has still not been resolved. But I don’t know why almost all official homepages not to renew information, maybe the meteorite lake is more charming. You can read a article of popular science (http://libserver.wlsh.tyc.edu.tw/sa/pdf.file/ch/c077/c077p108.pdf). Presently, not have any English paper or homepage, so I don’t have else links, only have Chinese academic papers. Thanks for the extra info, i’ll update the post soon. I think you’re that it being a meteor lake is more romantic! can I use your picutre in my fb?? Thank you and thanks again for the info! For day hikes just a decent pair of hiking boots, rain jacket and quick drying clothes are ok. A wide-brimmed hat is good for keeping the sun off your head too. For longer hikes you’ll probably need a lot more gear. Is there anything specific that you’re looking for? 50l pack, sleeping bag (there are winter and summer bags), rain jacket, warm clothes, quick drying clothes, first aid kit, pots, burner etc.. I usually get most of my gear from here http://www.metroasis.com.tw/ They have a store on Zhongshan N. Rd, near the Civic Blvd and the main station. I have been mountain biking in Taiwan for 16 years, most of the rides on Five Finger Motuntain and Yangminshan, but I have also done the Stone Deer Trail 4 times and Neng Gao twice on my mountain bike. Are any of the other trails you have hiked worth attempting on a mountain bike? I don’t mind the occasional hike-a-bike, but prefer it comes with some flow-y singletrack to make up for it. You could have a look at the Syraroko Historic Trail in Hsinchu. Last time I was there, there were a couple of ppl biking it. I’ve heard of people doing the Tonghou near Wulai by bike too but i’ve never hiked it myself. I have a few free days during my visit to Taiwan in early/mid June. I will be in the Taichung area. Can you recommend some moderate hiking spots that might include hot spring visits that are close to Taichung? This is my first visit to Taiwan and I want to see some of the legendarily beautiful natural sights before returning home. Thanks for the recommendations! There’s Dakeng nearby to Taichung. If you wanted to visit hot springs too, you could head up to Guguan, some great hiking up there. Could you help me with the uncertainty created by some online reading: is August, in terms of weather (those scary typhoons…. ), good time to visit Taiwan? The aim is to do some hiking and just travel around. What’d you say? I wouldn’t let typhoons put you off. If one comes, you’ll just have to stay indoors for a day or two. Last year, we didn’t any. It’s really touched to see your blog and to know someone who love Taiwan so much! I love hiking, too. And I just went to Jiaming Lake 3 weeks ago. Jiaming Lake is really amazing and unforgettable place. Thanks for the sharing of your hikes and trails, and of course, as well as for the beautiful photos!! Looking forward to your next hiking! Could you recommend any easy non tourist guided one day hike based in Taroko or Yanmingshan area? We have a group on facebook and we often organise free day hikes and low cost overnight hikes too. I really wanna do some hiking here! Want to start with the one day trip Teepot Mountain-Banping Mountain-Jiufen. soo my question is: Are these one of those mountains you have to ask permission for first or can I just go? And secondly, would you consider it a trail for high-scill and endurance people? You can just go, there are some signposts for the hike in Jinguashi. It’s about a 4-5 hour hike, climbing around 700m. Thank you this blog! It’s awesome! I love adventures, hiking and river tracing activities. But the thing is, some of my friends don’t like adventure and the others don’t have time… 😦 I’m free on weekends and have some adventure. I was wondering, is there a group of people who also want to go but can’t find many people? How do I go those places with group? I live in Taipei and have a car. But still stuck here…. It has been 4 years now and haven’t had a real adventure…. Thank you for your reply!! You could join our Facebook group for Taiwan Adventures. We organise a lot of high mountain overnight trips and the occasional free day trip to the mountains around Taipei. the link to the community centre is broken, should be this one instead? I”m coming to Taiwan this Thursday for 10 days. I’ve been doing lots of research on hiking opportunities and have found your site really helpful! I’m hoping to do a bunch of hiking around Taipei and the Northeast coast as well as in Taroko. I’m an avid hiker who likes a challenge. The whole permit thing seems to be limiting some of my options though, so any advice on which hikes I should do over the next week and half? Are you looking for day hikes? In Taroko you can do Dali-Datong or lushui wenshan. You need a permit but it can be applied for on the day at the police station. Around Taipei, teapot mountain for views of he coast is good. Wuliaojian and huangdidian are two exciting ridge hikes. You can do all of them by bus/mrt/taxi/train. Yes, mostly day hikes (full-day, or close). Those options sound good. Also, I really want to do the Zhuilu Old Trail; it seems amazing, but is there any way I can get a permit for it by next week? It would be hard. Have a look for the Taroko lodge. The owner might be able to get you a permit. It’s also a good place to stay. I left a message on cycling tab in regards to mountain bike rides. I am also interested in going on a group hike. Are there any such groups that you know of that meet on the weekends? I know giant have a load of stores all over Taiwan for renting bikes. I run a hiking company called Taiwan adventures. You can have a look at our up coming events on the site or join the Facebook group. 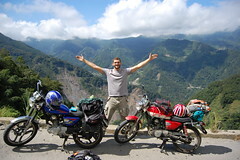 Have a look at Facebook for Taiwan adventures, 523, Taipei hikers and hiking and riding in Taipei. hi Stu, i stumbled on your website and was wondering whether you have any tips concerning the following. My boyfriend and I plan to cycle highway 11. do you know if there is any way to forward luggage? second of all, we are interested in doing the walami trail, any suggestions how to combine cycling highway 11 and the hike? cheers! The Hwy 11 ride is stunning. I live in Hualien and have done the ride too many times to remember, each one a different version. If you want to bike 11 and hike Walami there are some options. In terms of riding, #2 is the best, then #1, then #3 (beauty, solitude, few larger vehicles). In terms of speed/efficiency, #3, #1, #2. I personally am not a huge fan of #3 because the road is a bit more popular and you get more cars, the road is wider and less ‘authentic’ feeling. Alternatively, depending on your biking prowess, you could bike straight to Taitung along Hwy 11. Then either take a train to Yuli (with your bikes) or bike up Hwy 9. To be honest, Highway 9 is nothing special. It has its beautiful sections, but not a highlight of the biking scene in TW. Also, check out Hwy 193. It parallels the coastal mountains, but on the western side. This is a curvy, undulating road that is very remote in places and quite beautiful. If you decide to do route #1 or #2 (above) you could link to 193 instead of 9 and make the trip southward to Yuli much more secluded and interesting. As route #3 takes you directly to Yuli, there will be no need for 193. Luggage forwarding – not sure. You can have scooters and cars sent via the train system (TRA, not HSR) but I am not sure about luggage. Camping is available along the way on beaches or school yards (ask for school camping, dont ask for beach camping, just do it. Paid camping at JiCi beach (south end) or free camping (north end), and ShiTiPing has camping (and cool geology). But, if you prefer to pitch a tent on the sand away from everyone else, just pick a beach and do it. All police stations offer free water and bike repair (basic), too. Hi, Your blog is very informative, well done! I have a question. I am thinking of hiking in Taiwan alone this June. Not sure which one to attempt. 1) Huangshan(China) with a light pack(maybe about 8kg) over 3 days staying in mountain hotels, considered light hiking. 2) Wugongshan 武功山 1918m(China), with about 20+ kg pack. Hiked over 3 days, camped for one night with own tent. I would like to try a higher mountain this time, with great views. I am thinking of attempting Yushan for 2-3 days, but am unsure if permit application will be difficult as I have not attempted any high mountains before, although I will be hiking on weekdays. What other alternatives would you recommend for length of 2-4 days? I will hiking on my own. I am from Singapore, reading and speaking Mandarin is not a problem. Thank you for reading and keep on hiking! Just a short question: is it possible to camp by the lake in the summer? If yes, what are the red-tapes. Not now. The rules recently changed. I am coming to Taipei on 10th Sept and looking for 2 day hiking trip which starts from Taipei. Can you please let me know if any trip is available? Hi there, My husband and I are keen to hike O holy ridge. We’d prefer a guide. Taiwan adventures won’t take anyone on the hike that hasn’t been with them before. Can you please suggest someone else that would be willing to guide us. We are very experienced hikers and adventure travellers, but prefer to have someone with us if possible. I’d appreciate your suggestions. Hi, Is there any upcoming hike this 01-07Jan? 3-4days of hike will do. my friend and I are planning to visit Taiwan next spring. We will be in Taiwan for a month, and we are planning to do some overnight hikes during our visit. 1. In which month is it better to visit – March or May? 2. Which areas of Taiwan are recommended to visit during these months? 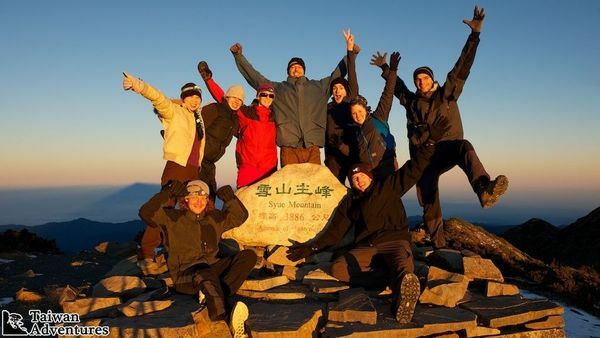 I would like to inquire about guided hiking tour in yang ming shan. I would like to do 2 days 4-5 Dec 2015, one day easy walk, one day medium challenging. Average 6-8 hours each day. Are the different trials to walk about for 2 days ? Hi I will go to Taiwan in the midle of April. And I want to know if there are some hiking trips from the soufth central of Taiwan who I can do with my boyfrind a lone with out a guide ? And you know a book with some hiking trips an a map ? There is a quite a lot on the site that is great. I plan to try and do a couple longer trips over the next year. As I preoare though I would like to know if you can suggest any day hikes around Taichung, or even over night hikes, that are not paved and heavy with stairs. I know dakeng exists but I am not too keen on the wood/log paths. Any trail or hike from North to South? If you ended up in Taroko it could have been the old Hehuanshan trail, but that doesn’t exist anymore. Or not least it isn’t complete and you can only walk parts of it. Im planning a hiking trip to Taiwan in Oct 2017, would you be able to propose to me some of the better tour operators? Hello, I am looking at a lot of the smaller hikes such as Pingxi trail, Sandiaoling trail, HuangDi Dian Hike, Wuliaojian, the four beasts, and teapot mountain. Do all of these require permits by any chance? It may seem like a silly question, but I am just trying to figure out if most areas require the permit or if I am safe to do these trails without a permit. Thanks for very useful information! We are trying to plan multi day hikes around end of December start of January. We made many long treks but we dont know so much about the climate here. Assuming the worst case scenario what type of sleeping bag would we need? What should be the comfort temperature of the sleeping bag? We have all other camping equipment, warm clothes etc but we need to invest in sleeping bags, but we can not decide. How cold can it get at night around possible high altitude camping spots? Great post, would love to do this sometime! hello sam, I am considering visiting Taiwan between January and june staying in keelung, can you suggest any good places from there, not extremely experienced but interested in the adventure. Hi! Planning to hike Yusan this June. Travel solo. Need advice to get there from hotel. Can some kind persons help? Worry I may get lost and the trip may go up in smokes. I keep track of nearly all my adventures in Taiwan here. Please feel free to email me if you need anymore information about any of the posts, itineraries, trails etc.... Thanks for reading and happy trails!